Presumably there were survey drawings of other floors in particular the first floor for which designs were also made but if so they have not survived. 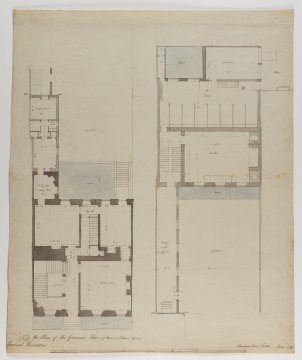 However, a survey drawing made in 1808 (see ) shows that the kitchen and stable, as usual, lay behind the house. More interesting is that a comparison between the two survey drawings shows no changes whatever. Some of the dimensions vary by an inch or so but otherwise they are virtually identical.